It's amazing how much life that Nemesis legend has isn't it...As for the press release, all the crap about it being a record breaking Italian ride is there. Gotta love it, 200 tennis courts. I did half think that when I saw it, yes! And yeah, they've evidently been taking marketing lessons over here Never mind, our one will be better. Riiight.During summer I was away around Lake Garda and very luckily got a chance to visit Gardaland. 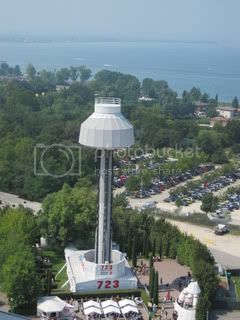 For me Gardaland has always been the kind've park I hear about, but never really research into. So this would be a really nice new experience. 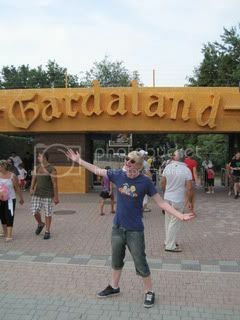 Trip report time then, large pictures ahead!Gardaland did a great job at the entrance with its many topiaries and nicely themed water effects, it even had it's own cheesy theme music with lyrics! Got into the park very promptly considering how busy it was so a big plus there. First ride of the day was BLUE THUNDER. The parks Vekoma SLC. Advise anyone not to sit at the back unless you want a brain hemorrhage. Seriously. Apart from that it was a fun ride with a nice water effect half way through. Only thing that really kinda sucked was that theming was kept to a bare minimum and the queue line is just one long endless Cattle pen. 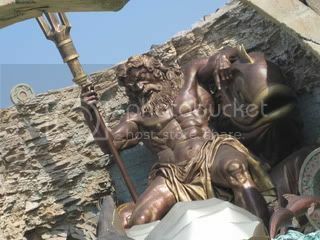 Did Fuga da Atlantide shortly afterwards and loved it! Very well themed, atmoshperical and exciting drops. Big cattle pen queues again but lovely fans spraying mist, was a scorcher that day. Very very clean water which was also nice. Next up, Space Tower, which funnily appears huuge on the map but in reality it's a tiny little thing. Small, but forceful and reasonably themed. 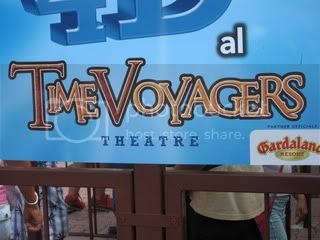 I'm sure you can imagine that I was very excited about seeing Time Voyagers in Italian, though to my disappointment it'd been replaced by Sponge bob 4D *sniff* Not to worry though, the show was far more entertaining than Time Voyagers ever was for me, which is good considering I had no idea what they were saying in Sponge bob. Magic Mountain! The parks Vekoma looping coaster, it had 2 consecutive loops so instantly loved it! Was much smoother the Blue Thunder and really like the fountain in the middle of the helix. No theming but a reasonably short queue and offered lots of nice photo opportunitys around the area. Sequoia Adventure! An S&S Screaming Squirrel. It was weird but hilarious, little theming unfortunately but very nicely situated in the magic mountain area, meaning for near miss or two. I kept this photo large because if you look closely at the guy with his hands up at the front you'll see his hats flying off, action shot ftw! Otherwise a truly strange coaster, but nevertheless a fun ride.Managed to do a lot more that day but really cba to upload that all so will maybe save it for facebook. Final Thoughts:Gardaland was a great mish mash of different rides and themes. Colorado Boat was a real gem, so much fun and wonderfully landscaped. The main criticism I suppose would be that there are some great themes but none of them are consistent. It felt a bit like a badly made rct park at times with random generic paths leading to strangely placed themed presets, that said though I had a fantastic time and recommend it for anyone who has the possibility of going. Thank you Gardaland! 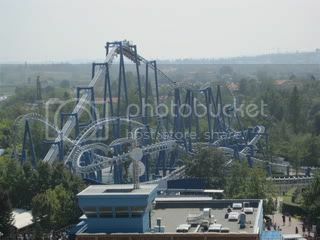 Glad you had a good time there, it is a fantastic park, very well looked after!Blue Tornado - Indeed, very rough! It was the only ride at the park I really hated, sadly.Magic Mountain - Again, agreed. Such a lovely ride, the restraints were so comfy and the ride was smooth as anything, really enjoyed this, it was my little brothers first inversion, was a proud brother that day!Sequoia Adventure - Actually, I go back on my word, this was the worst ride, totally pointless imo. But overall its a great park, did you do Mammut and the Mad House ride in the tree house, both are quite enjoyable. Track has started to arrive on site! 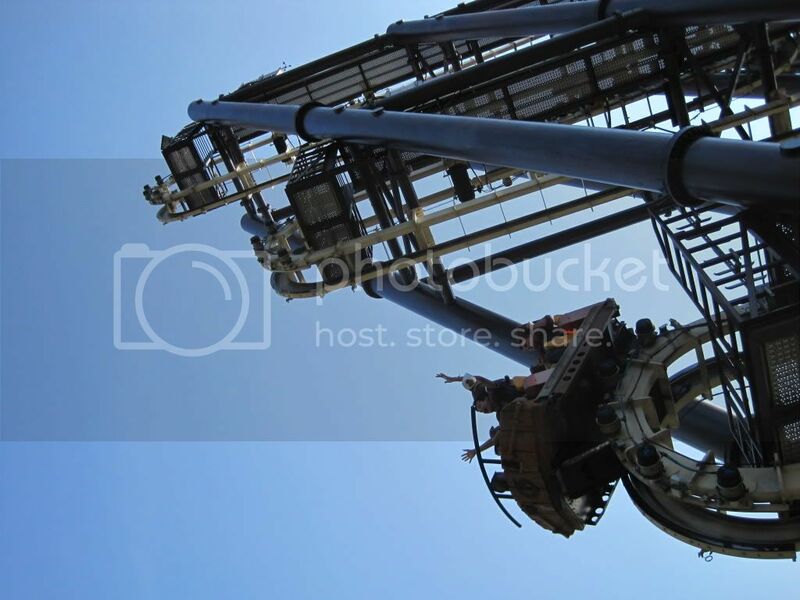 ^ Wow, that track is massive; the lift motor was bigger than that man! Can't wait until Thorpe get something like this is 2012. The brake run track and final turn are up, as well as some of the track in the station! - WebcamAlso, a great update has been posted over at TPR with some great shots of the track and supports ect - Link13/10: Track continues to go up at quite a quick pace! Also been following this project, looks very interesting. I think the major part of this project is the trains though, so hopefully we can get to see them soon. Why hello there Mr. Support, why are you confusing us all? ^From what I can tell, the trains basically come very close to them. Hmm....Is that part of the heartline roll by any chance? Is that part of the heartline roll by any chance? 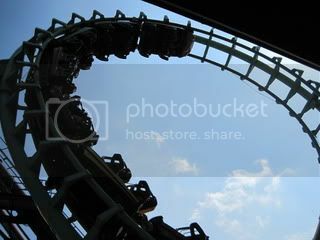 So is it this type of coaster we will be seeing at thorpe in 2012? I don't know, ask maybe in the dedicated topic for that in the Thorpe section perhaps? Yes, but maybe with added rotating seats? That support just looks like 'the train is not going to fit through it'?- This makes me wonder actually what the trains look like?And yes, we may see one of these at Thorpe in 2012, or any other type of B&M; or even any other type of coaster. Can't wait to see a vid of this Gardaland coaster testing when it is ready! Oh I see it now! Woah... Yeah it is a bit of a feet chopper! They have a little measuring thing, I've seen a picture of it on the track as it's been going up... Although I rather imagine it was measured and designed to fit before it was built anyway The only thing I wonder about, is the reach envelope of riders, it looks awfully tight...Edit:Picture 13 in this updateAlso, this confirms (along with the close up pictures of the lift hill catwalks) that the seats are set well below normal height above the rails.